The ‘Beast from the East’ and Storm Emma made us wonder whether we would get away at all but by our departure day the snow had melted at home and local transport was getting back to normal, so our journey to London was uneventful. Much of the rest of the country was still suffering from the effects of which had battered the UK and other parts of Europe in the preceding few days. From our hotel near London City Airport we could see planes landing and were reassured that we would be on our way the following day. On arrival in Florence we treated to an upgrade by the hotel and settled in. It was situated a little out of the old city centre which turned out to be a blessing as even out of season, the old city is very busy. 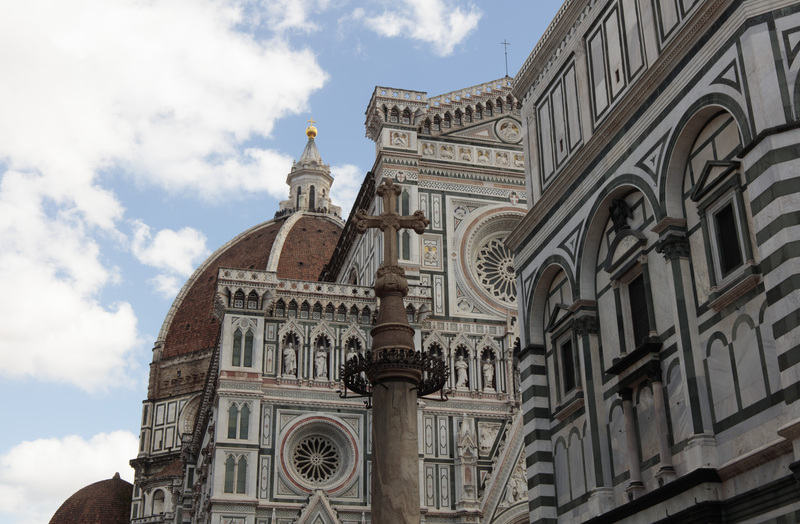 A 10-minute bus ride got us to the Duomo and cost less than it would in Edinburgh. 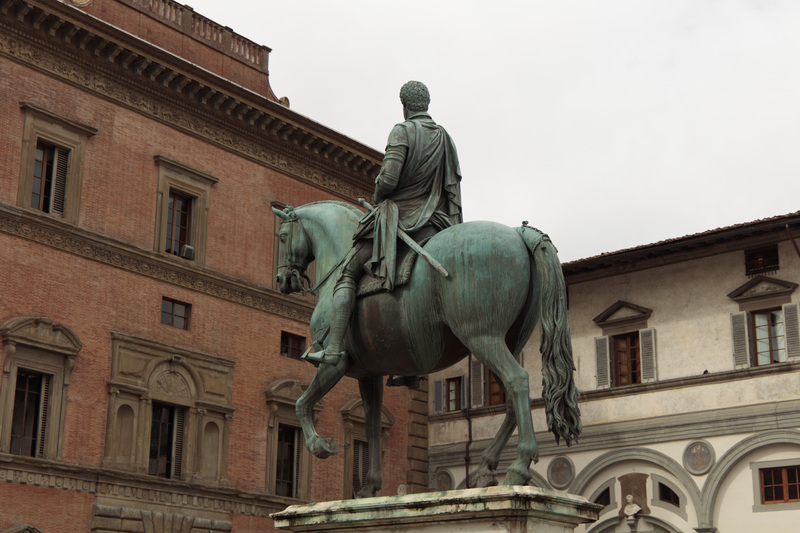 On our first morning we left the queues outside the Duomo and headed for the Leonardo da Vinci Museum. 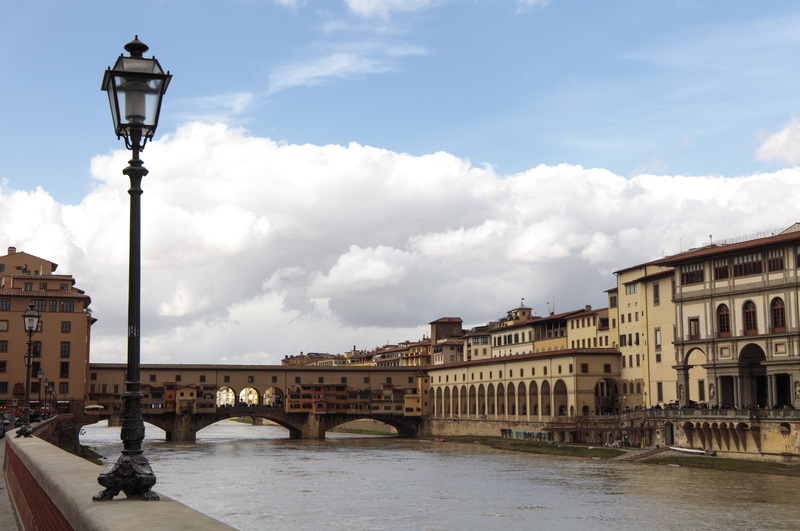 Florence is littered with museums and the very keen can opt for the 72 in 72 hours prepaid card, but it is probably better to be selective if you only have a few days. I find I can only process one gallery per day. 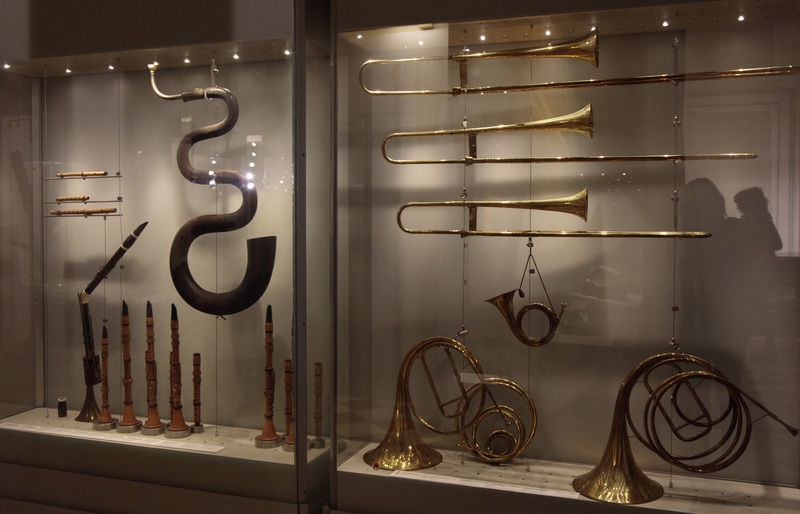 The Leonardo da Vinci Museum has models of his many inventions and also covers his exploration of human anatomy. Most of his drawings are held elsewhere in the world, some at Windsor Castle. The museum has interactive sections where children can build models. 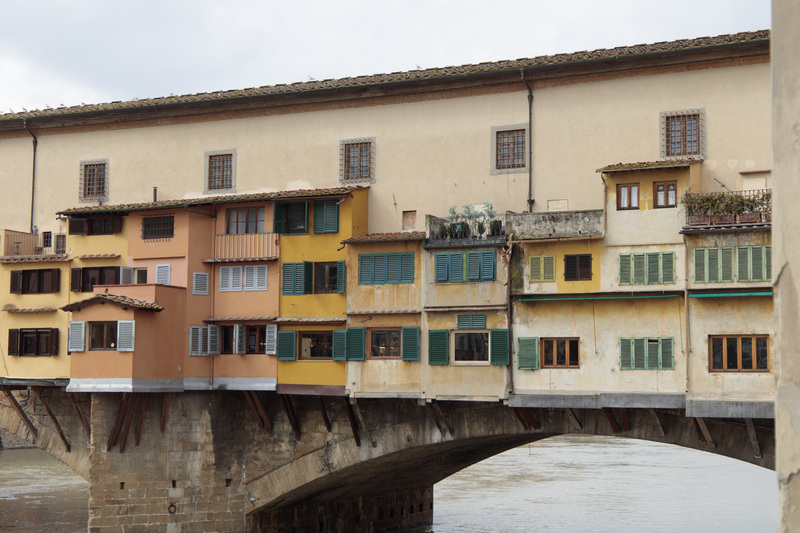 Afterwards, fortified with coffee, we wandered down towards the river where the Ponte Vecchio was very crowded. 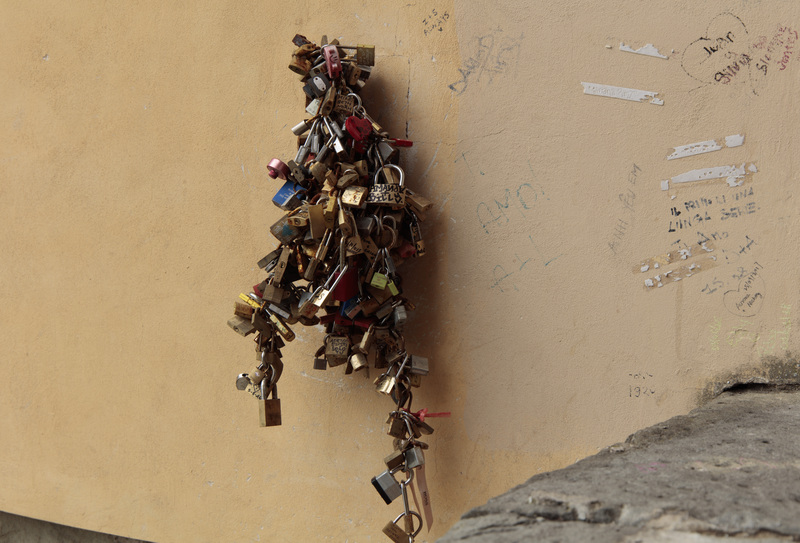 The craze for putting padlocks on bridges has reached Florence. Walking around the city we encountered a chocolate market. Florence is well-supplied with bookshops, both new and secondhand and a lovely shop selling hand-printed paper where I bought some gifts. Navigating around some parts were made tricky due to the tram system work and extensions. 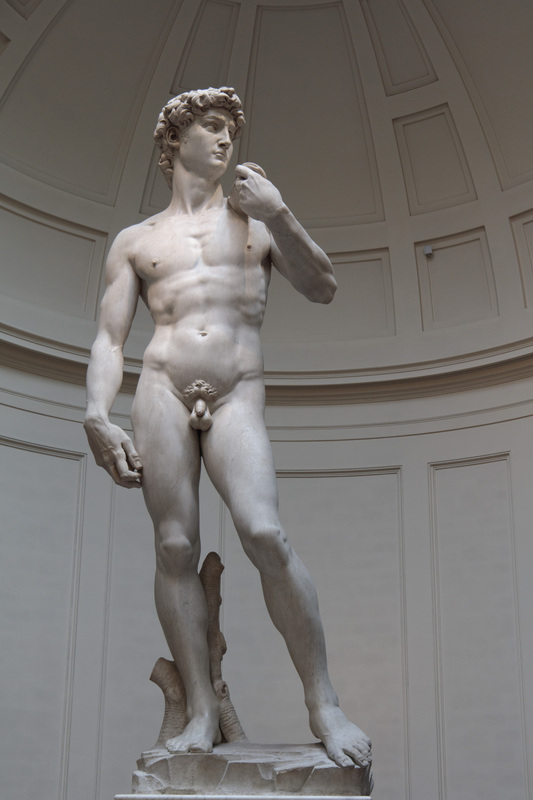 On our second day we visited the Galleria dell’Accademia getting soaked en route by a heavy thunderstorm and hail. 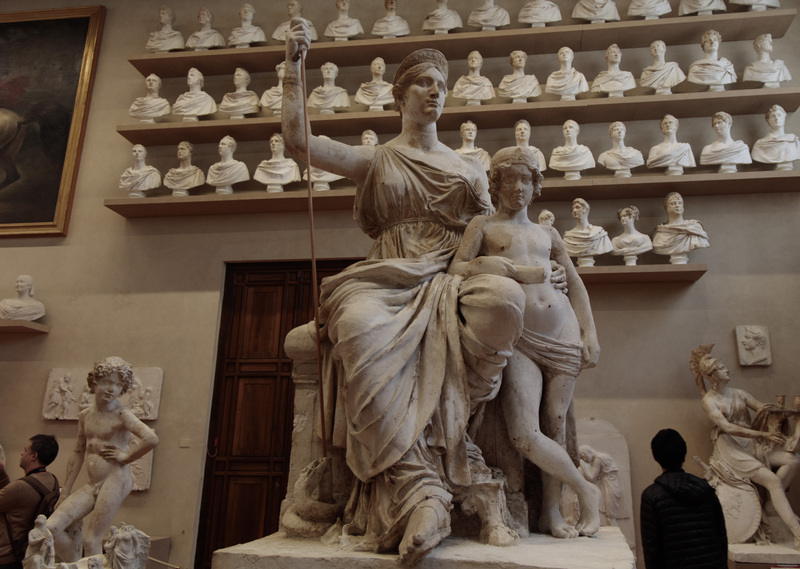 but also houses the four statues of the Slaves commissioned by pope Julius II as a decoration of his grave which are known as “The Prisoners” and other works. 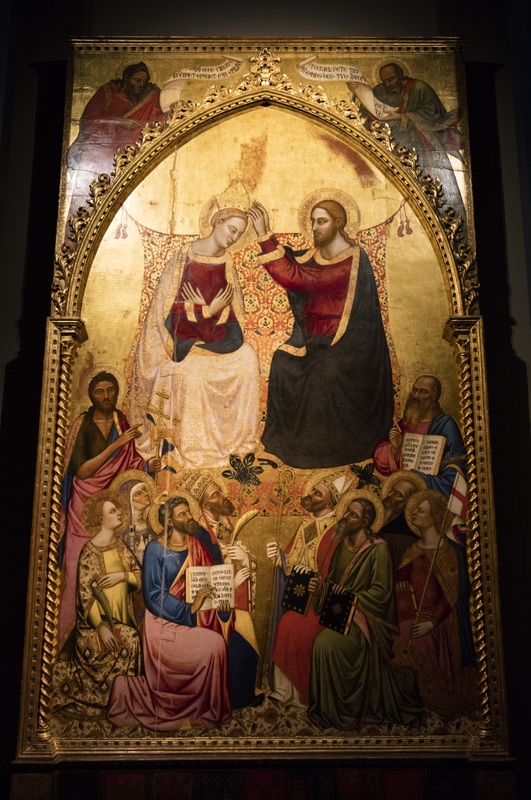 There are rooms full of medieval and later paintings by Florentine artists, rooms devoted to plaster models for sculpture, fabrics and a museum of musical instruments. It was certainly worth getting there early as when we left in the late morning, it was getting fairly busy. The sun had emerged, so we had our lunch on a bench in a piazza with pigeons and house sparrows watching in case we dropped a crumb. I enjoyed seeing works I have known from History of Art classes at school and even the ceilings are magnifcent. The funeral of the Italian footballer who died last week was being held in Florence at the Basilica de Santa Croce on Thursday and we saw people walking home afterwards. There were also demonstrations following the murder of a Senegalese man at his market stall on Monday. The sun had come out and before we returned to our hotel, we enjoyed a gelato. Growing up in Scotland, many towns had an Italian gelateria selling a product far superior to the Walls and Lyons Maid sold in regular shops. Some Scots-Italians’ ancestors arrived in Scotland in the late 19th century having escaped famine and poverty in their homeland. Today, many remain in the catering industry. All too soon our brief stay was at an end but we will return as there is so much more to see. Breakfast was at 6am on Friday morning as we had to catch the 7.20am ferry back to Milazzo. The sun was rising as we arrived at the port, just in time to hit the morning rush hour but were were soon on the autostrada towards Taormina. The original plan was to walk from Castelmola to the top of Monte Venere, a limestone mountain nearby. 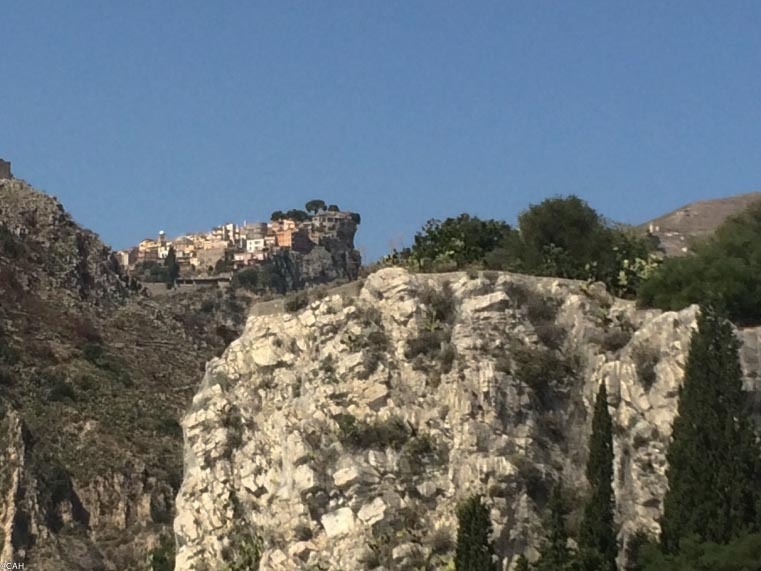 As it was forecast to be at least 32 degrees, a few of us decided that was too hot for the climb on bare rock and opted to explore Taormina instead. The walkers were dropped off close to 10am and it was already very hot. We were taken to the town and after a coffee, started to explore, coming across a photography exhibition of work by Letizia Battaglia. She documented life in 1970s Palermo and this exhibition was entitled ‘Rompere il muro de silencio’ (Breaking the wall of silence). She was one of the people interviewed by the author of a book I am currently reading: Midnight in Sicily – on art, food, history, travel and Cosa Nostra by Peter Robb who lived in southern Italy for 15 years from the late 1970s and returned in 1995 to write the book . Our walk around the town led to the discovery of an old portion of Hellenic mosaic, many intriguing alleys, old churches and an antique map shop. We found one to add to our collection: a French map of Sicily in the time of the Greeks published in 1806. 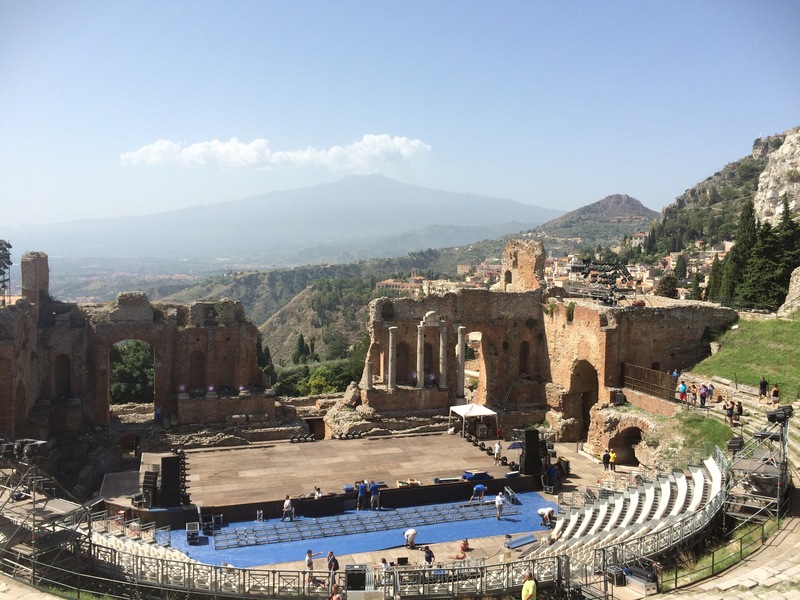 The Teatro Antico was on a high point with views of Mount Etna and the coast and quite amazing despite being prepared for a concert. There is also a large public garden with an interesting tale about its development by a woman banished from the UK by Queen Victoria as she was deemed an unsuitable mate for her son Edward. She later married the mayor of Taormina and created the gardens before dying at the age of 55. Things we did not expect to find in Taormina were an Irish pub and someone wearing a Manchester United shirt. 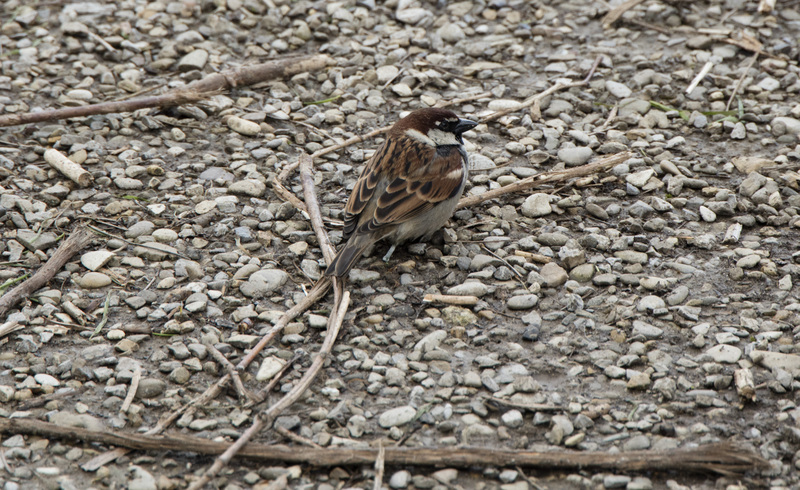 Afterwards,we met up with the others. They had got to the top of Monte Venere but had to take a bus back down because of the heat. A public bus took us down to Giardini Naxos which is less pricey than Taormina. It is very much a beach resort with hotels, stalls and a lot of tourists but on Saturday morning we found the archaeological park and museum which documented the earliest settlement here. It has the remains of houses outside and two museum buildings with the house contents and those of an early shipwreck. We met an Irish couple who told us about a large Roman villa in the centre of Sicily that has some very good mosaics and has taken several years to restore. That will need to be left to the next trip to this part of the world. The garden nearby provided welcome shade from the heat. It was then time to head to the airport. We could have enough material from our time there to contribute to Little Britain’s ‘Come Fly With Me’. The staff at the bag drop desks were having a prolonged conversation despite the long line of people waiting. When we got to passport control there was no-one there. Eventually a dour-faced man appeared and spent ten minutes logging into the system. I got no response to my ‘buongiorno’ and he glanced at my passport and shoved it back to me without making eye contact. 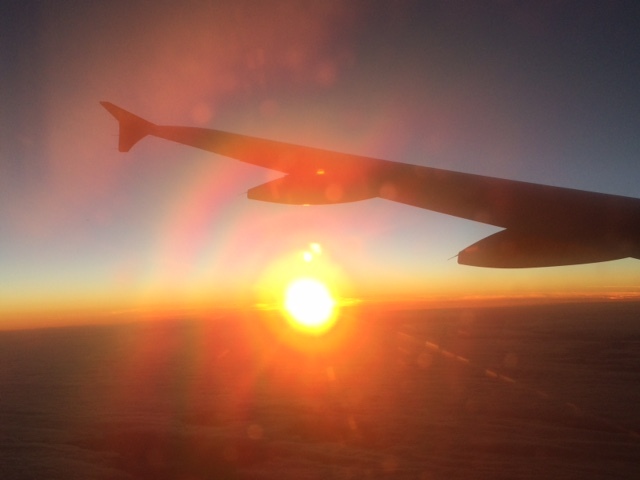 Fortunately we were soon in the air bidding goodbye to Mount Etna and watching the sunset over France. Yesterday morning after a leisurely breakfast on the terrace of our hotel it was time to pack up and enjoy a couple of hours wandering around Stromboli town before our ferry was due to leave. I dipped my toes in the sea and added black sand to the black dust already coating everything. We watched a cat trying and failing to catch a gecko, had coffee and pottered around the streets. Beyond the port was a path behind the beach which allowed some photography of the sand, the coast and some seedheads amongst the foliage. Back at the port I was struck by the colour and abstract shapes at the edge of the dock which might develop into a painting when I get back. The hydrofoil journey was uneventful and we were soon at Lipari, our next stop. It was quite strange to be back in a busier and wealthier town. We dragged our cases along the main street to the hotel and we were glad to see had a pool as it was very hot. After checking in, it was time to explore the town. 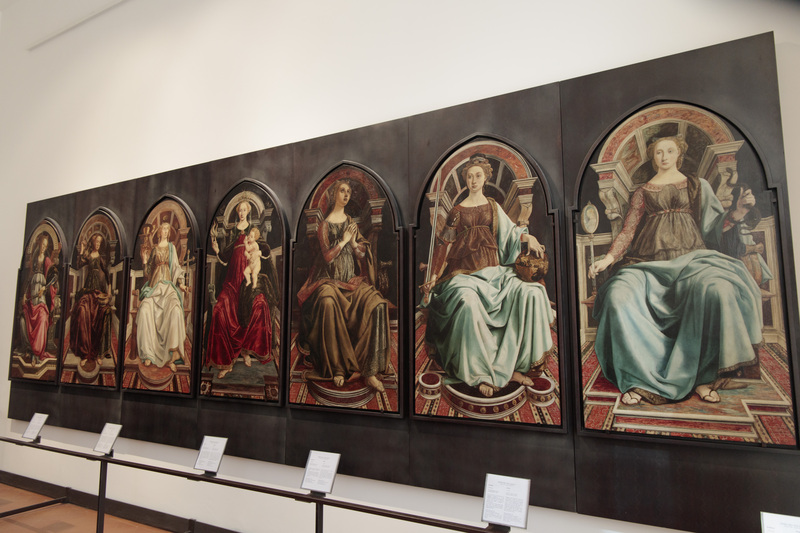 The Cattedrale di San Bartelomeo was not open but the museums were. We bought a ticket and went into the nearest which covered Greek and Roman history. We got a bit of a telling off from the staff for not going to the building that covered the neolithic period first and they were very keen that we followed the correct chronological order of rooms rather than dipping into what we fancied. 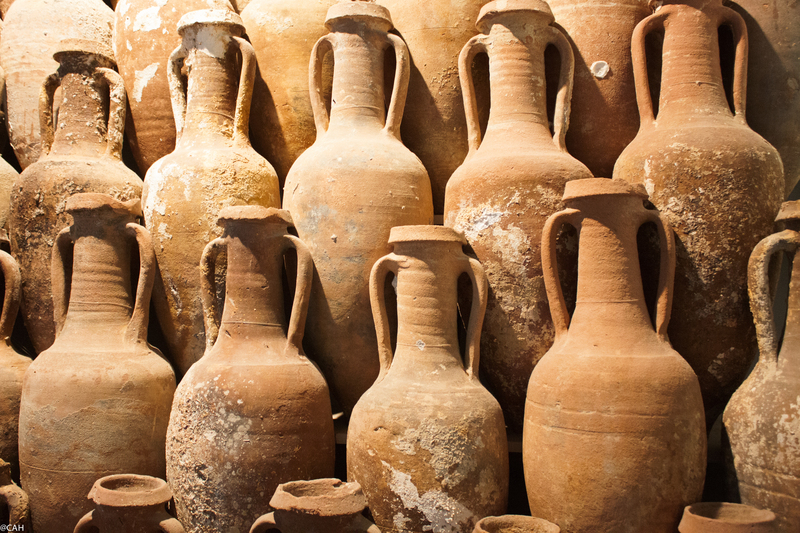 I have never seen so many amphorae. Nearby was an exhibition of contemporary art situated in a former church which provided a contrast. There was supposed to be a visit to the site of some Roman baths at San Calogero and the obsidian mines but this was off as the Roman baths are closed for some reason but at least it gave us some wandering time. This morning we took a short ferry ride to Vulcano and as we did not leave until 9am it was getting hot with 32 degrees forecast. As we approached the path to the crater one woman coming down commented that we should have been here four hours earlier. It would certainly have been my preference to have come to the island the previous evening and started to climb much earlier in the morning to avoid the heat. We slowly got up to the first ridge whoch gives a good view of the crater. 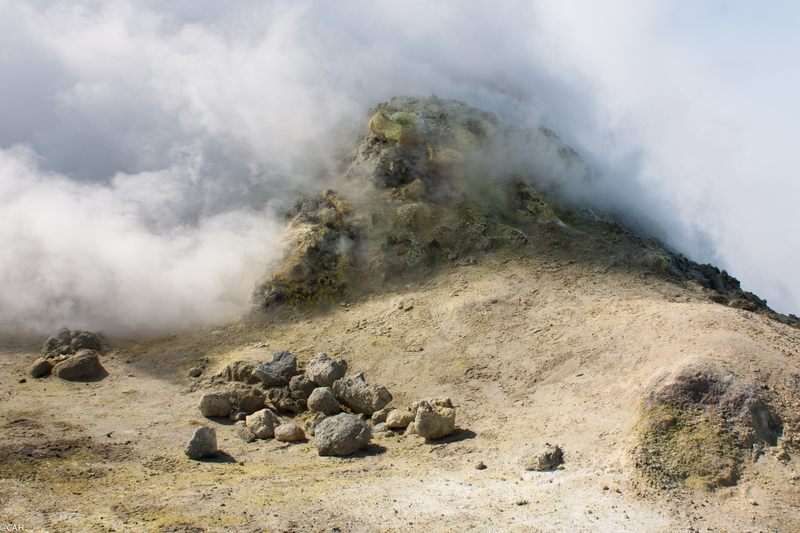 The sulphurous gas was stinging my eyes and our guide proposed to continue to the highest point and walk past the place where the gas was being emitted. We decided to go back down the route we had ascended and met up with the rest of the group for lunch in one of the bars down in the town. No-one was keen to have a mud bath, even the smell as we walked past made us walk more quickly. We spent an hour on the black sand beach, some people swam but I like the sea as warm as the Indian Ocean before I take a dip. All too soon it was time to head back to the ferry and I pondered that at least this somewhat whistlestop tour is useful to identify places to return to and spend more time in. A 4am awakening and 5am departure was necessary to get the ferry from Milazzo at 7.20am. Some people can sleep on buses and boats but not me. We found a seat near the front to give James more legroom only to find that a crew member had to climb over him every time we came into a port as he was in charge of the ropes. 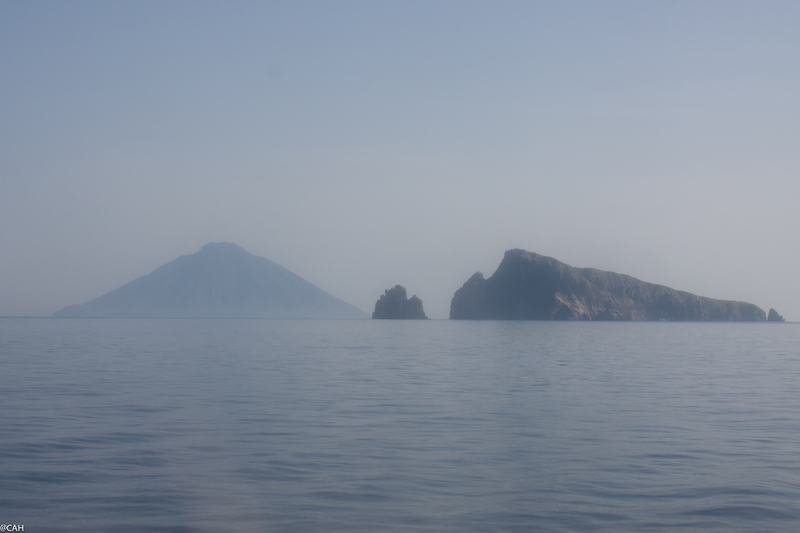 The sea was calm and the ferry called in at Salinas and Lipari before we caught our first sight of Stromboli ahead. Having docked we walked to the office so that those who were climbing to the summit this evening could sign all the documentation (we are not as James strained a muscle on a descent the other day) and then picked up supplies before settling in at our beachside hotel and having lunch. The town is very pretty with narrow lanes and alleys and a black sand beach which we will have time to explore more tomorrow. The volcano towers above it. Now it is time to get ready for the small climb to the 400m viewpoint. 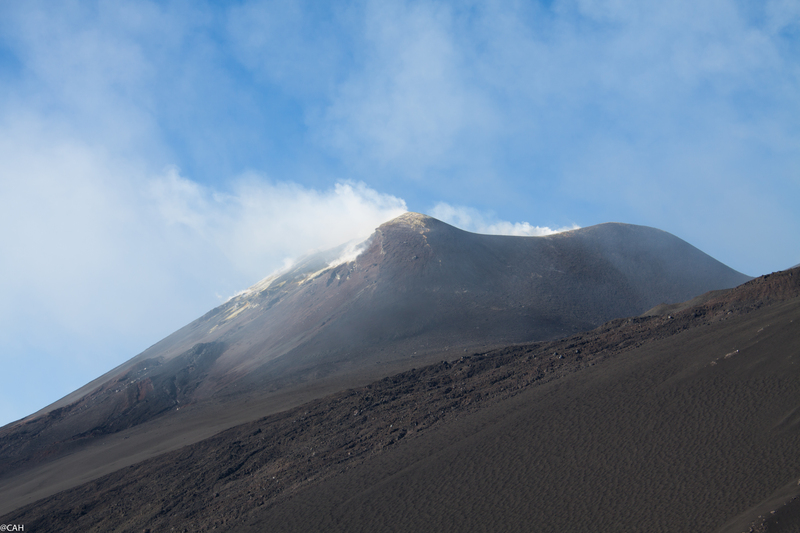 Up and out early this morning for an attempt to climb to the summit area of Mount Etna. We took the bus so far and then had to switch to four wheel drive and pick up our guide Franco before heading into the National Park. 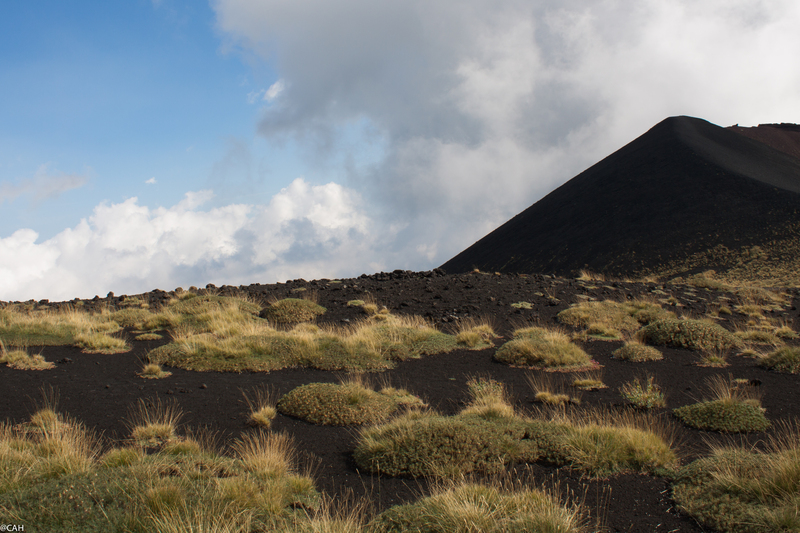 The aim was to tour the Northeast Crater which is the highest at 3300m, the central crater which is 2000 years old and the Bocca Nova formed after the 1968 eruption. The southeast crater dates from 1971. 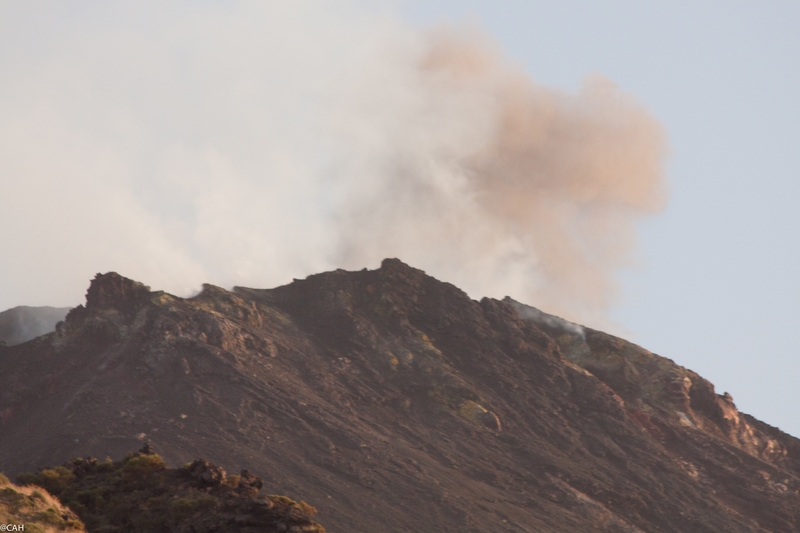 There are numerous lava flows from the various eruptions. Here is an early view of the mountain on our way up. We could hear explosions underground and ash clouds and sulphurous smoke came out of numerous fissures and crevices. The landscape is almost as if you are in another world and I took over a hundred photographs. Here is one of the craters. Walking among the lava flows is tiring and it would be so easy to twist an ankle between the rocks so watching where to put your feet is a must. 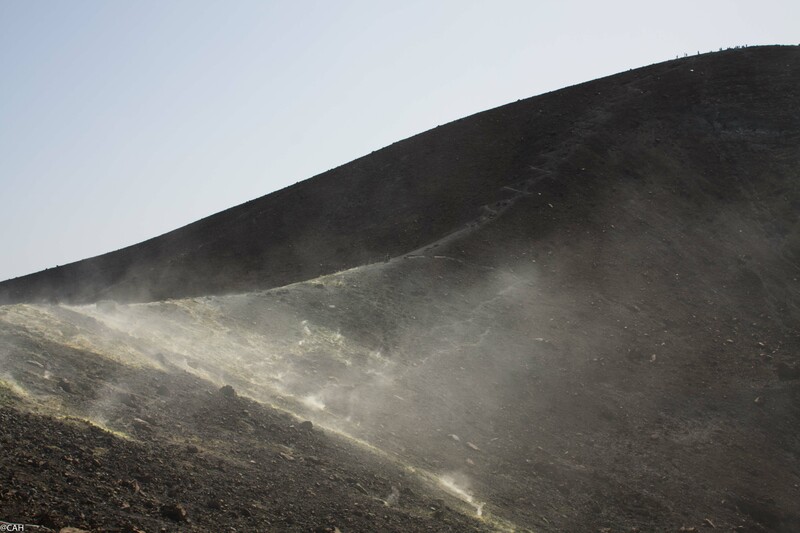 We did a long descent through the ash from one of the eruptions. Scree walking skills are useful but taking care to avoid dislodging a lump of lava and causing it to roll down on one of your friends. When we were traversing the side of one of the ash cones, two people above us were sliding down the side causing lava rocks to come down onto our path and delayed some walking along it. 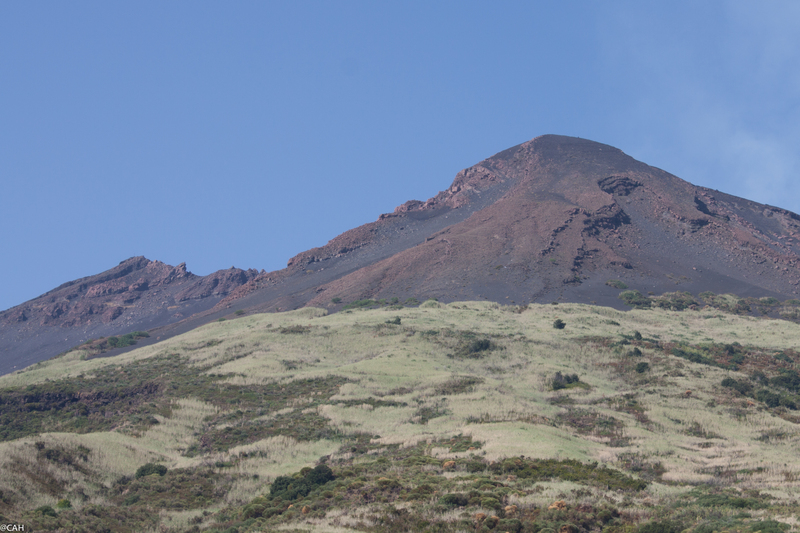 On the lower slopes plants have started to colonise the lava flows. Today was a slightly later start and we were driven up to 1900m to walk across the 1865 lava flow, up the ash cone and then look down into the crater. There are many interestingly shaped ‘bombs’ of rock and lava and some distorted trees. There are birch and pine forests which we walked through and had a break at Monte Barranco. We crossed three dry river beds and were then nearer the 2002 lava flow. 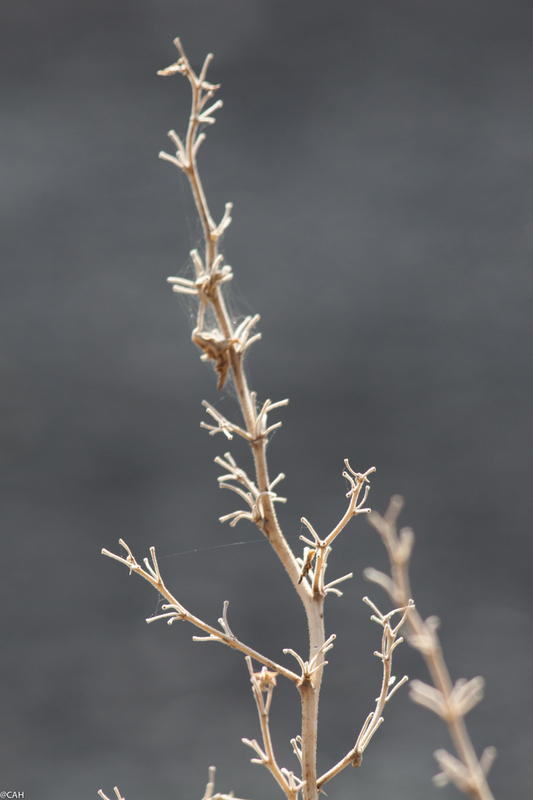 Many dead trees in all sorts of contorted shapes stand in midst of the lava. Eventually it was time for a refreshment at one the bars and then a steep climb up one of the ski runs before descending in a beech forest where our bus was waiting. We had a short wander round Linguaglossa but it was the four hour siesta so most of it was closed. It was then back to our hotel to get ready for tomorrow’s early start. On Saturday we left Gatwick a few minutes late and as I always like a window seat, saw the white cliffs of southern England disappear and the blue of the English channel in sunlight provide a complementary colour to the orange on the wings of the Easyjet plane. I passed the time on the flight reading the Saturday papers and trying to resurrect my cryptic crossword skills. We passed over the snowy peaks of the Alps and then down the east coast of Italy. The Aeolian Islands appeared, some quite obviously extinct volcanoes and then we were in the cloud with some turbulence before landing at Catania. 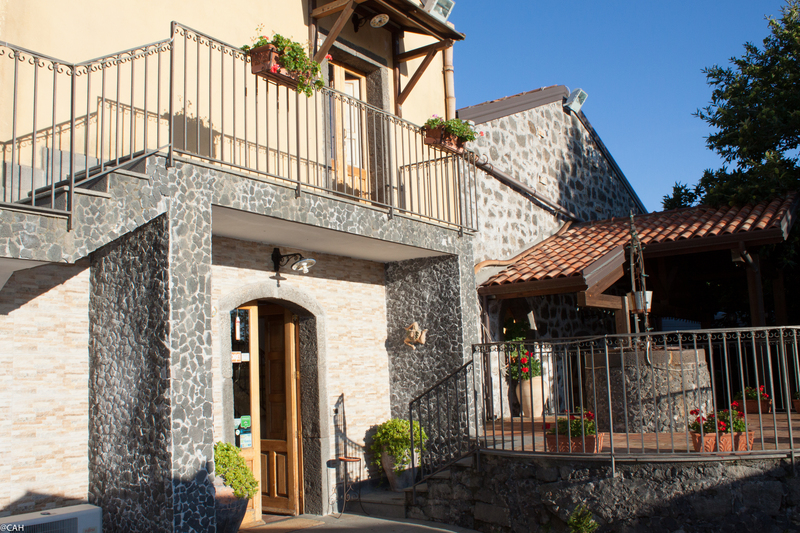 It was 26 degrees but once our group had gathered and we had met our tour guide, Elena and the bus driver, Giuseppe, we set off on the hour long drive to our hotel which sits at 1000m on Mount Etna’s flank. We got good views of Etna (Europe’s highest volcano) and the sun going down from the bus but could not stop for photographs. The mountain weather forecast has changed a little from dry all day tomorrow to rain in the afternoon but aim to reach the summit so there is and early start tomorrow. 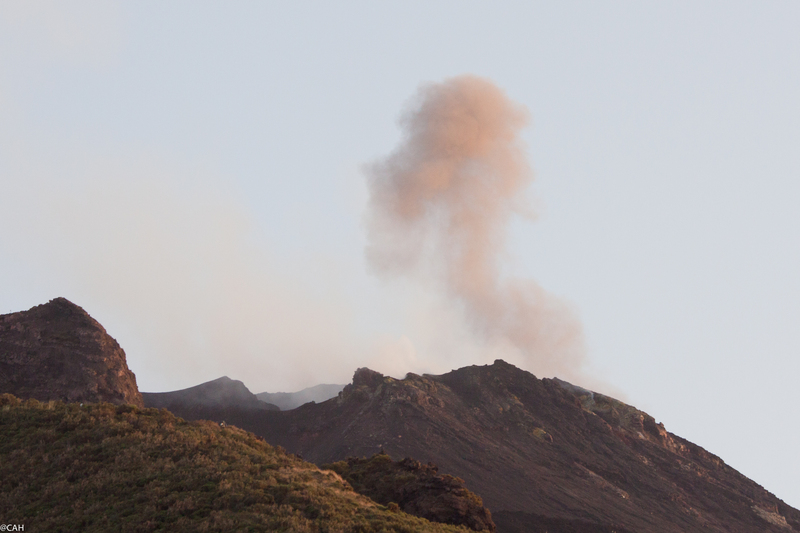 Etna last erupted in May of this year. Settling into the hotel, meeting all the group and sampling the local cuisine and wine was the priority for the evening.